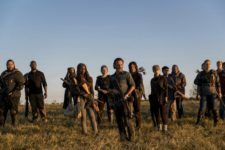 The Walking Dead (pictured): It was in the season 7 finale of The Walking Dead that both Rick and Negan finally said it was time for action after previous episodes teased a face-off between the two. Then season 7 proceeded with 15 episodes featuring more lead up to the showdown. After all that time, after all that teasing, after all that strung-out plot, did the finale satisfy? No, because it could’ve been a lot more. Grade: B. Billions: I’m going off this show after being a faithful watcher: the dialogue gets worse and worse and laughably jacked-up. Here, Dake and Connerty offering Chuck Sr. full immunity in exchange for testimony against his son. Grade: C+.